Apple just released the first Public Beta of iOS 12 for those among you eager to have an hands-on experience with the amazing fast features that Apple is bringing to your iPhone, iPad and 6th generation iPod touch this fall. iOS 12, announced earlier this month at WWDC brings a bunch of new features. Faster and more responsive The things you do every day are faster than ever — across more devices. iOS has been overhauled for improved performance on devices as far back as iPhone 5s and iPad Air. Smoother animations Animations are smoother across the system. So when you do things like bring up Control Center, swipe while multitasking, or scroll in apps, it’s more fluid and responsive. Up to 50% faster keyboard display* The keyboard appears faster and typing is more responsive. Up to 70% faster swipe to Camera* Swiping to Camera from the Lock screen happens faster so you never miss a moment. Up to 2x faster Share sheet display under load* The Share sheet appears faster than ever, especially if you have a lot of sharing extensions installed. Group FaceTime Make FaceTime calls with up to 32 participants simultaneously. FaceTime audio and video Answer incoming Group FaceTime calls with video or audio on iPhone, iPad, and Mac, or join with audio on Apple Watch and HomePod. Join anytime Join or add people to Group FaceTime at any time. Focus View in Group FaceTime During Group FaceTime, the speaker will automatically be front and center. Or with Focus View, you can double-tap the person you’d like to see. Ringless notification Group FaceTime uses a silent notification that participants can tap to join. Messages integration Start Group FaceTime right from a group Messages conversation. See and join active calls from the conversation list or in the conversation itself. Animoji Use FaceTime with your friends and family as your favorite Animoji or Memoji. Text effects Add text effects like speech bubbles and emoji to your photos or videos. Filters Transform your look using built-in filters, like classic black and white, comic book, and watercolor. Shapes Jazz up your photos and videos with shapes like stars, hearts, and arrows. iMessage sticker packs Download sticker packs from the App Store for iMessage to enhance your photos and videos. Stickers track the movement of your face and move with you. Private end-to-end encryption FaceTime is encrypted end to end for both one-to-one and group calls, so your conversations remain private and viewable only by the participants. Memoji Maker A new tool for you to select and adjust nearly endless customization options to make your Memoji. New Animoji Try four new Animoji: T. rex, ghost, koala, and tiger. Tongue and wink detection Improved face tracking now recognizes when you stick out your tongue or wink. Longer Animoji Now you can record clips of up to 30 seconds. Camera effects Use the camera in Messages to capture photos and enhance them in new ways using built-in effects and third-party sticker packs. Screen Time New tools empower you to understand and make choices about how much time you spend using apps and websites. Activity reports Get reports weekly or check Today View anytime to see app usage, notifications, and device pickups. For kids Use your family’s Apple IDs to set up Screen Time for your kids to keep an eye on how much time they spend on apps and websites. They can request more time for you to approve. App limits Set the amount of time you and your kids can spend each day on specific apps and websites. Downtime Set a specific time, like bedtime, when apps and notifications are blocked. You can choose which apps are on and off limits. Always allowed Create exceptions for apps you’d like your kids to have access to even during Downtime, such as Messages or education apps. Grouped notifications Message threads and notification topics are grouped together, so it’s easier to see what’s important with just a glance at your iPhone or iPad. Instant Tuning Control your notification settings the moment you receive an alert, without having to leave what you’re doing. Deliver quietly Within Instant Tuning, you can choose to have notifications delivered silently to Notification Center by default so you’re not interrupted by alerts. Siri notification suggestions Get suggestions based on how you interact with your notifications, such as which app notifications to deliver prominently and which ones to send to Notification Center. Critical alerts A new type of opt-in alert for important information, like reports from a healthcare provider, which you’ll receive even during Do Not Disturb. Do Not Disturb During Bedtime Dim your display and silence overnight notifications until you unlock your iPhone in the morning. New Do Not Disturb options Set Do Not Disturb to end automatically in an hour, at the end of the day, when you leave a certain location, or at the end of a meeting on your calendar. Persistent and multiuser experiences AR experiences can now be shared across time and fixed to real-world locations, so you can create a piece of AR art that can be viewed later in the same place by someone else. 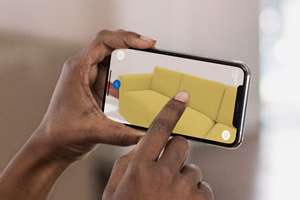 3D object recognition ARKit 2 recognizes objects and how your device is oriented to them, and can use that information to trigger AR experiences. Face tracking Face tracking now sees where you’re looking and can detect whether you’re sticking out your tongue or winking. Scene reflection AR is even more lifelike, enabling virtual objects to reflect the real-world scene in your camera. USDZ file format A new format that helps 3D creators to create rich content and animations optimized for mobile devices. AR Quick Look View AR experiences in the apps you use every day, including Files, Mail, Messages, and Safari. Measure app Automatically measure flat rectangular surfaces and draw lines across flat surfaces to measure distances with your iPhone or iPad camera. For You tab A single destination for your Memories, Shared Album activity, and the best moments in your library. New Featured Photos and Effect Suggestions intelligently show you your best photos and propose effects to make them even better. Sharing suggestions Photos understands when you’ve done something meaningful, like taking a trip or attending an event, and will suggest sharing the photos with the people who are in them. And if you receive photos from someone else, your device will look for photos in your library from the same event and suggest sharing in photos. Intelligent search suggestions Smart suggestions help you find photos even before you finish typing by suggesting events, people, places, and relative dates. Event search Search for photos from events you’ve attended, like the Aspen Ideas Festival. Multiple keyword search Now you can combine keywords in searches, like “surfing” and “vacation,” for even better results. Improved import It’s easier than ever to import photos and videos from your professional camera on the go. RAW photo support Import and manage RAW photos on your iPhone and iPad and edit on your iPad Pro. Redesigned Albums tab Find existing and shared albums more quickly and efficiently. Improved Portrait Lighting Portrait mode photos are better than ever. Camera now generates a mask when it detects a person and intelligently and elegantly separates the person from the scene. Portrait Segmentation API A new API for third-party developers allows for the separation of layers in a photo, such as separating the background from the foreground. Improved QR code reader Camera now highlights QR codes in the frame, making them easier to scan. Siri suggestions A quicker way to do the things you do most often. As Siri learns your routines, you’ll get suggested shortcuts for just what you need, at just the right time, on the Lock screen or in search. Add to Siri Add shortcuts to Siri to run them with your voice on your iPhone, iPad, Apple Watch, or HomePod. New Shortcuts app Create or customize your own shortcuts to run multiple steps at once. Get started with examples from the gallery and personalize with steps from across your apps. Shortcuts API App developers can work with Siri to run shortcuts via a new SiriKit API. Motorsports Get live standings, schedules, rosters, and stats for NASCAR and other racing series. Translation Translate phrases into many more languages, with support for over 40 language pairs. Photos Memories search Use Siri to quickly pull up photos and memories based on people, places, events, time, and keywords of objects and scenes in the photos. Passwords Siri can help you search for any password. Enhanced tracking prevention Improvements prevent Share buttons and comment widgets on web pages from tracking you without your permission in Safari. Safari also prevents advertisers from collecting your device’s unique settings, so they can’t retarget ads to you across the web. Automatic strong passwords Automatically create, autofill, and store strong passwords in Safari and iOS apps. Passwords are stored in iCloud Keychain and are available on all your Apple devices. And if you ever need to access your passwords, just ask Siri. Password reuse auditing Passwords that have been reused will be flagged in the passwords list, so you can quickly navigate to the app or website and replace it with an automatically generated strong password. Security code AutoFill SMS one-time passcodes will appear automatically as AutoFill suggestions, so you never have to worry about quickly memorizing them or typing them again. Password sharing Easily share and receive passwords from nearby iOS devices, from an iOS device to a Mac, and from an iOS device to Apple TV. Password Manager API Access passwords stored in third-party password managers directly from the QuickType bar in apps and in Safari (requires third-party adoption). Apple Books The Apple Books app has been completely redesigned to make it easier for you to discover, read, and listen to your favorite books. Access your current book or start a new one in the Reading Now tab, visit the new bookstore to browse and buy, and organize your library with more flexible collections. Stocks The redesigned Stocks app keeps you more informed about the market. View prices at a glance in the customizable watch list. Tap any ticker to see key details and an interactive chart. Learn about what’s driving the market with business stories from Apple News. And for the first time ever, Stocks is available on iPad as well as iPhone. News It’s now easier to navigate your news feed. Swipe down to jump to your favorite topics and channels on iPhone or tap the sidebar on iPad. Voice Memos Voice Memos has been redesigned and is available on iPad. It’s even easier to capture your personal reminders, edit class lectures, or share family moments. And with iCloud, you can record on your iPhone or iPad and harness the power of your Mac to do even more. CarPlay navigation CarPlay now supports third-party navigation apps, giving drivers even more choices for a familiar experience on the dash while they drive. Contactless student ID cards With contactless student ID cards in Wallet, you can use your iPhone or Apple Watch anywhere student ID cards are used on and off campus. Simply hold your device near the reader to access places like your dorm, the library, and campus events. Or pay for laundry, snacks, and dinners around campus. More battery information The battery usage chart in Settings now shows your usage for the last 24 hours or 10 days. Tap a bar to see your app use for that period of time. iPad gestures iOS 12 for iPad includes updated gestures that make it easier to navigate. You can now go to the Home screen by quickly swiping up from the bottom of the screen. Get to Control Center more conveniently with a swipe from the top-right corner. New dictionaries Enjoy three new language dictionaries: an Arabic and English bilingual dictionary, a Hindi and English bilingual dictionary, and a Hebrew dictionary. English Thesaurus Get synonyms and related concepts for words with English Thesaurus. In order to install the iOS 12 Public Beta, either login or sign up to the Apple Beta Software Program. Once completed you will then be able to download and install the iOS 12 Public Beta Software Profile, following a reboot you're then ready to install iOS 12 via Settings>General>Software Update. We praised iOS 12's stability and reliably during our recent iOS 12 Hands-on of the Developer Beta 2. Even so, we can't in good conscience recommend that you download the Public Beta on your daily iPhone or iPad. As always, before proceeding backup your iDevice.